Filter by Standard Deluxe Ed. Super Deluxe Ed. 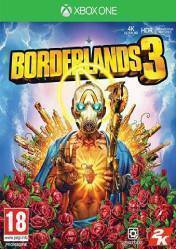 Important: Before buying Borderlands 3 for Xbox One, Gocdkeys would like to remind you that this product may be available in different versions and formats. Although most XBOX ONE games are globally activated, especially digital versions, some may have regional blocking, so we recommend reading all the information in this regard. The digital versions of Xobx One games are usually cheaper than the physical versions, and usually are in key format, so we simply enter the code we receive after purchase in our Microsoft account to start the download. It is possible that some stores sell Borderlands 3 in account format, and that from Gocdkeys we label with the label "Accoun Format" that consists of a user name and a password to access an account that already has the game. For more information on how to activate this type of format for Xbox games we recommend reading the information in the stores that have it available. Also, in the price comparison of Borderlands 3, you will find its different editions: The standard edition, and the Deluxe and Super Deluxe editions, which include different content for the game and the Season Pass. Looking for the best deals and prices for Xbox One Borderlands 3 before release. At Gocdkeys, we update all store prices daily to offer our users the easiest and most efficient way to find this game at the best price. Some prices may not match, but it's because stores are constantly changing prices to match demand. However, you can set a "Price Alarm" from the button at the top of the store list, and it will warn you when this game falls below a certain price. It's the next installment of the famous Borderlands franchise, with billions of weapons combinations and an adventure full of chaos and humour. Explore new worlds and enemies as one of the four new Hunters and with the characteristic touches of the saga, with the possibility of playing alone or in cooperative mode. With countless enemies of all kinds, from mutants to all kinds of beasts, but all have something in common, they are crazy and always keep interesting treasures. There are no comments yet about Borderlands 3. You can be the first one! ALL Borderlands 3 Gun Brands! - INSANE PERKS! - HUGE CHANGES! - Loot System Info!